Weebly is one of the most popular web builders available today online, with millions of users worldwide ranging from your hobby bloggers and small business owners to large ecommerce websites and big brands. Weebly’s offering is excellent, so as you would imagine there aren’t too many alternatives that can match or exceed their level of service. Although I have listed two that I think are a lot better than Weebly. DIY website builders have been around for a while now, with Weebly being one of the first to hit the scene and offer people an alternative to employing a web designer to build their websites. The thing with Weebly is that you either love them or hate them. It’s a platform that isn’t for everyone. People often talk about the lack of template variety and the lack of urgency when it comes to bringing in new features that other web builders are launching every month. In my own personal opinion, Weebly may be the most popular web builder but they are far from being the best on the market. 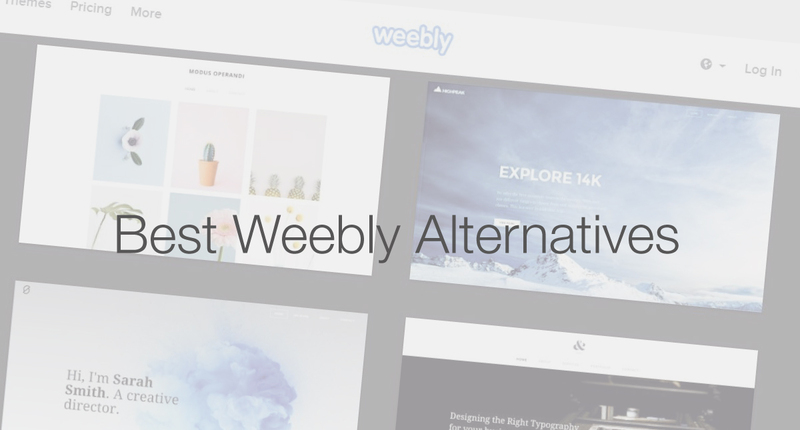 I want to show you the alternative web builders to Weebly and showcase some of the features and functionality that other web builders have that Weebly don’t have. Wix is probably Weebly’s biggest competitor, and to be fair, a far supeor web building platform. To start with, Wix offers over 500 beautifully designed web templates that are spot on when it comes to today’s web design trends. These templates are also highly responsive and easier to implement on the Wix platform. This is an area where Weebly falls back on. Their template library is limited when you compare it to Wix. Also with Wix, the templates come pre-populated with content, which makes it easier to visulize exactly what your site can look like, and you’re able to just change the pre-made content with your own. Because the Wix templates are already structured and formatted for you, you no longer have to struggle with web builders like Weebly and Squarespace in creating your own page layouts and second guessing what certain formatting features will look like. Wix.com is ideal for those who have none or very little design skills. It’s also perfect for those who have no experience in web development as the user interface is so intuitive. Read more over at my wix review. The next web builder that I think brings a lot more to the table that Weebly is SiteBuilder.com. The main reason why I think this web builder is a credible alternative to Weebly is the quality and variety of Sitebuilder’s templates. They have highly professional and slickly designed templates that I think athetically are superior to Weebly. You won’t find many web builders that are better than Sitebuilder’s templates, as well as the robust and innovative web building tools, it’s hard to find better elsewhere, other than perhaps Wix.com. In terms of usability, both Weebly and Sitebuilder are similar. Sitebuilder’s user interface looks and feels slightly better than Weebly, but its a close call. Sitebuilder is super intuitive and you can literally have a site up in less than 10 minutes. Sitebuilder is also a better choice over Weebly when it comes to ecommerce capabilities. If you’re looking to build out your own online store, then Sitebuilder offers this functionality with their lower cost packages, compared to Weebly who only offer e-com in their more expensive packages. Read more over at my SiteBuilder review. I’ve added in Shopify as an alternative to Weebly’s e-commerce offering, only because Shopify is light years ahead of Weebly when it comes to providing a robust and innovative e-commerce solutions. If you’re looking for a web builder that can offer you a shop building facility along with everything else that goes with an e-commerce business, then stay away from Weebly and use a platform like Shopify. 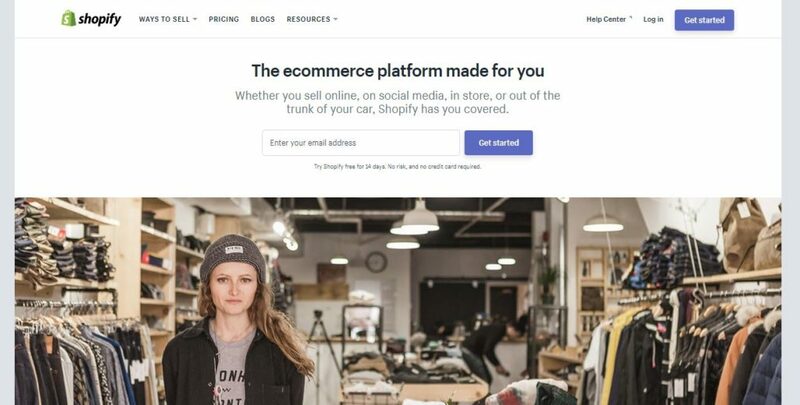 This is what Shopify was built for, creating online businesses that have the functionality of being able to sell their products through their own website. Some businesses want to venture down the route of blogging and content marketing to gain new customers as well as achieving the goal of building out a fully featured eCommerce store. Shopify will do all that and then some, as they have all the blogging capabilities as Weebly, along with exceptional web templates.